Thailand’s economic development and the overall well-being of its population in the coming decades will depend greatly on how effectively the government is able to formulate programs that build resilience to a changing global climate. 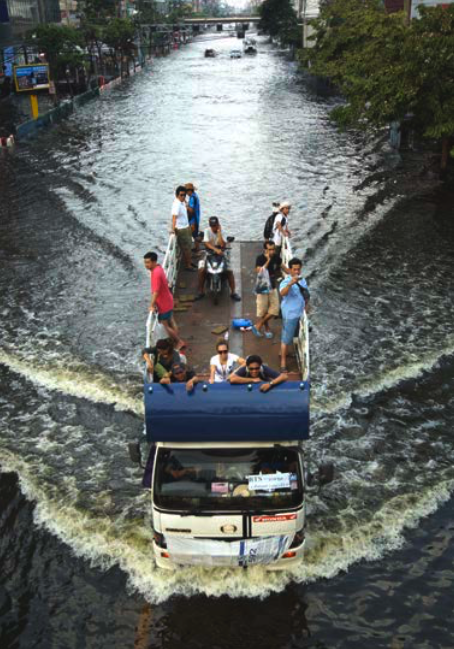 The floods in 2011 opened a window to the impacts that climate change will have in Thailand, and there should be no doubt that these will be both increasingly frequent and intense. Additionally, as its economy continues to grow, Thailand is contributing an ever-increasing proportion of the greenhouse gases to the global whole and thus will also need to consider how it can advance and accelerate its current climate mitigation efforts. Both of these imposing challenges are made even more difficult by the uncertainty of the exact nature, intensity and pace of changes in climate during the coming decades in Southeast Asia. Thailand’s climate change mitigation and adaptation programs will require current, accurate and relevant knowledge about weather patterns, health trends, relative vulnerabilities and other information that can only be gained through well-conceived, coordinated and monitored research. With this in mind, the Government of Thailand called for a unified and strategic approach to climate change research that would support the preparation of high quality climate change policies, programs, and projects. USAID Adapt Asia-Pacific, at the request of the Royal Thai Government, provided assistance in the preparation of a National Climate Change Research Strategy. The Research Strategy was needed because current climate change research is largely uncoordinated – making it exceedingly difficult to focus research efforts on issues of highest national priority – and research results often do not reach the hands of policymakers, planners, and practitioners who need to have evidence-based information in order to effectively achieve their mandates in the climate change field. The draft final National Climate Change Research Strategy was presented to stakeholders in July 2013, and recieved official government approval and rollout in late 2013. A major benefit of the Research Strategy is Thailand can expect that project proposals will be targeted at priority issues, that there will be minimal duplication of effort among researchers, and that the research outcomes will be available to policymakers and practitioners. This briefing note describes the principal activities undertaken in the development of the strategy. Preparation of the National Climate Change Research Strategy was undertaken by the National Research Council of Thailand (NRCT) with the Royal Institute and the Office of National Resources and Environmental Policy and Planning. ADAPT Asia-Pacific provided technical and financial support for preparation of the strategy. A small technical team of international and national experts was formed to prepare the Research Strategy with guidance from an advisory team of Thai scientists. The team undertook background studies to determine the current state of climate change research in Thailand, the policy setting, past needs assessments and related information. The team also considered climate change research from an international perspective to ensure that the strategy would be relevant both at the national and international levels. Over a 6-month period, a comprehensive consultation process took place in all four regions of Thailand, specifically in Bangkok, Chiang Mai, Khon Kaen, and Hat Yai. Views were solicited from scientists, who will produce the data, and from government officials and civil society, who will use the data, and from donors, who may help fund the research. Their views were incorporated into a draft document that then underwent a formal review process. In July 2013, the draft final National Climate Change Research Strategy was presented to 100 stakeholders at a concluding workshop held on the premises of NRCT. A consensus was reached that the Research Strategy was appropriate and should be approved by government and implemented. Specific comments received during the workshop were incorporated into the document and the Research Strategy is now being finalized. Official government approval and rollout of the Research Strategy occurred in late 2013. A major benefit of the Research Strategy is Thailand can expect that project proposals will be targeted at priority issues, that there will be minimal duplication of effort among researchers, and that the research outcomes will be available to policymakers and practitioners. Additionally, the knowledge that is gained through this research can contribute to new climate change project proposals of high quality that are competitive for financing both domestically and internationally. USAID Adapt Asia-Pacific (2013) Building a Foundation for Evidence-based Climate Research Action in Thailand. Briefing Note. USAID Regional Development Mission for Asia: Bangkok, Thailand.